An additional push can help Bangladesh bring down the number of urban extreme poor across the country by 2021, a leading economist said yesterday. Bangladesh had 7.7 percent urban extreme poor in 2010, according to the government’s statistical agency. Binayak Sen, research director of Bangladesh Institute of Development Studies or BIDS, said the number came down to 4.98 percent in 2016, as per his own projection. “So, urban extreme poverty eradication is around the corner, with a little extra push, before 2021,” he said at a workshop at The Daily Star Centre in Dhaka yesterday. Urban consumption poverty eradication is also possible well before the UN-set deadline of 2030, as it came down to 14 percent this year from 21.3 percent in 2010, he added. The sustainable development goals called for eradication of extreme poverty for all people everywhere by 2030; internationally, poverty incidence below 3 percent is considered zero poverty, he said. “But in a highly populated country like Bangladesh, 3 percent of the total population is a huge number. So, we have to work in both urban and rural areas to bring down the poverty level to zero percent to attain the SDG target on poverty.” Sen, however, said multiple risks persist. Apart from consumption poverty eradication, other deprivations in areas such as quality of education, health, nutrition, housing and transport have to be taken into consideration, according to Sen.
Mihir Kanti Majumder, chairman of Palli Sanchay Bank, said the declining trend of extreme poverty is encouraging. If the country can reap the benefit of the demographic dividends, develop skills of the youth population, and properly use its resources, Bangladesh would become a developed country, he added. At the workshop, Sen presented an impact of a project run by Dushtha Shasthya Kendra (DSK) with support from the Shiree project funded by UKaid from the Department for International Development and the Bangladesh government. ‘Moving from extreme poverty through economic empowerment’ started in 2009 and worked in several slums such as Karail, Kamrangirchar, Lalbag, Hazaribag, Mohammadpur and Mirpur. The project ended in 2016. Under the project, a non-refundable fund of Tk 14,000 was transferred to the beneficiaries. They were given training on income generation and were given access to health care facilities, said Masudul Quader, chief executive of DSK. “There are many people who are not deemed credit worthy or don’t know how to utilise the credit properly, largely because of a lack of capacity. We have identified them. Now they are able to run businesses on their own,” he said. Under the project, 30,000 households have come out of extreme poverty, said Prof Mahfuza Khanam, vice-president of DSK. Sen first conducted pilot surveys in the slums in 2011. In December, he carried out a final survey to measure the impact of the project. This time, the number of households was 950, including 200 households under a control group. The study showed annual income, savings and capital formation and assets have gone up for the beneficiaries compared to the controlled group. Access to sanitation and washing habits also improved. Beneficiary households registered 24 percent higher income compared to controlled households. The weekly consumption propensity for protein and micronutrient-rich items such as eggs, meat, dairy products and fruits is significantly higher in case of programme members, said Sen.
Setara Begum, a community leader in the city’s Karail slum, said she has been living in the slum for 25 years after she lost her home in Barguna to river waters. “I have been given training. I have been given Tk 14,000 as grants, which I used to start a teashop. I also started selling saris with their help,” she said. Binayak Sen, an eminent economist and a Research Director of the Bangladesh Institute of Development Studies (BIDS), recently completed a research work on ‘Middle Class’ (henceforth MC) in Bangladesh, especially relating to growth trends, drivers and policy implications. He deserves special thanks for invoking an interest in a topic hitherto untouched by Bangladeshi economists. At the moment, Middle Income Country (MIC) is the coin in circulation, not Middle Class population. We all know that Binayak has been a very powerful, if not the pioneer, researcher in poverty-related research in Bangladesh. His motivation in taking up MC reportedly springs from the emerging shift of focus on the ‘Middle Segment of Income Distribution’. According to his views, there are two main arguments for which MC should occupy the front seat in the days to come. The first one relates mostly to growth and employment. MC is considered to be good for inclusive growth – the larger the size or density of MC, the better it is for economic growth. The growth of MC (a) injects more stability into growth process due to less volatility associated with regular (salaried) jobs, (b) helps to accelerate the aggregate growth rate by releasing the domestic demand constraints to growth, and by fostering higher labour productivity, managerial skills and entrepreneurship; and (c) enables reduction of poverty faster than in countries with lower class density. On the other hand, the second arguments mostly apply to governance and risks. MC has beneficial institutional externalities such as (a) larger size associated with higher institutional quality via demand-driven economic governance channel, (b) improved quality of democracy through better and concerted articulation of democratic aspirations in areas of ‘core governance’. Again, ignoring the role of MC invites significant downside risks. Widespread discontent of middle class – especially among youth -with respect to deteriorating income distribution or mobility could cause political instability and social strife. To start with, Sen attempted to draw a MC line that embraces economic definition of MC (income-based). Although no unique definition of MC- even of income-based – exists around the world, he adapted various versions in national context to use for estimating the size and growth of the MC. The data for the analysis came from Household Income and Expenditure (HIES) over 1991-2010 when identified four groups (expressed as per person per day in PPP dollar using 2005 PPP) as follows: (a) Poor (below $1.25, (b) Vulnerable non-poor ($1.25-2.00); (c) Middle Class ($2.00-3.00), (d) Upper middle class ($3.00-4.00) and (e) Rich ( $4.00). The researcher observed a few interesting trends. There has been a significant rise in the share of national MC over the period between 1992 and 2000. Only 9 per cent of the national population belonged to this cohort; the matched figure went up to 20 per cent in 2010. The comparable figures for other regions are as follows: India 24 per cent; China 62 per cent, South Asia (including India) 17 per cent, Sub-Sahara Africa 26 per cent, and East Asia (including China) 59 per cent. 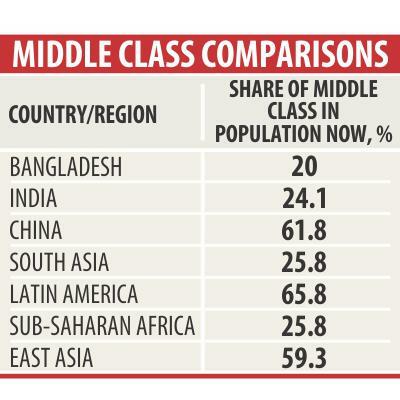 From a static view, Bangladesh falls behind others in terms of the proportion of MC people but ‘doubling the size of middle class is a dramatic success by any measure. If the present trend continues, middle class will comprise 25 per cent of national population in 2025 and 33 per cent in 2030’. Second, as the size of national MC grew bigger, the poverty reduction rate became faster. The author provides no explanation of how it happened although we expect it in detailed discussions. Third, there is a considerable bulge around $1.25 and $2.00 line. This indicates that the potential vulnerability to downward mobility (descent) pressures reign high. Fourth, these estimates need to be re-visited for robustness check in the light of US$ 1.90 line in 2011 PPP adopted by the World Bank for global poverty analysis very recently. “However, there is little doubt that expanding middle class has been good for stability of growth and accelerated poverty reduction in the 2000s…” Again, the process awaits explanations. Policy implications? The graduation to MC from poor is adducible to post-secondary education (especially English education), salaried jobs in the service sector, ‘digital divide’, access to financial saving institution etc. The growth of MC has been driven by property price appreciation and unequal spread of human capital (post-secondary education). Universalising social protection and health care will help overcome bulging around poverty and middle class lines. Balancing between ‘pro-poor growth’ and ‘pro-middle class growth policies’ is the most pressing policy challenges in defining inclusiveness etc. In an apparently ‘ambitious’ attempt, we have adapted Binayak Sen’s methodology to determine the growth and size of middle class in rural Bangladesh. The basis of our data is MH Data Base (Mahabub Hossain Data Base) comprising the repeat sample survey of households of 62 villages in 1988, 2000 and 2014. A la Binayak Sen, we wanted to have a glimpse into the growth of rural MC over time. We observe that roughly 7 per cent of rural population was in MC category in 1988. This compares with about 14 per cent in 2000 and 21 per cent in 2014. The rich segment, on the other hand, shot up from 3 per cent to about 18 and 37 per cent respectively during same periods of time. Our findings thus seem to corroborate Sen’s observations about MC growth in Bangladesh. The growth in rural areas has mostly been greased by remittances – accounting for one-fourths of household income from 6.0 per cent and business – claiming one-fifths from one-tenths of household income. The growth of commercial agriculture in tandem with expansion of non-farm activities – as supported by expanded road communication – could have contributed to the growth of middle class in rural areas. The mundane message is that in the days to come, research on ascent and descent centring MC line would replace that of poverty line. Abdul Bayes is Professor of Economics at Jahangirnagar University, (late) Mahabub Hossain was Distinguished Professor, BRAC University and Mahfuzur Rahman is Coordinator, Data Management Unit, RED/BRAC. প্রাচ্য ও পাশ্চাত্য :ব্যক্তিগত সংলাপ?